Tuesday 1 November saw Day of the Dead celebrations return to Chelsea College of Arts with a free event which filled the Rootstein Hopkins Parade Ground with Mexican-inspired sculpture, performances and a spectacular light show. Working in collaboration with the Mexican Embassy and Anglo Mexican Foundation, the event also showcased work produced by Camberwell, Chelsea and Wimbledon students and staff alongside visiting artists from Mexico as well as a traditional Altar from Mexico was exhibited, dedicated to all the stars who have passed away in 2016 including David Bowie, Prince, Chelsea alumnus Alan Rickman and Mexican singer-songwriter Juan Gabrie. 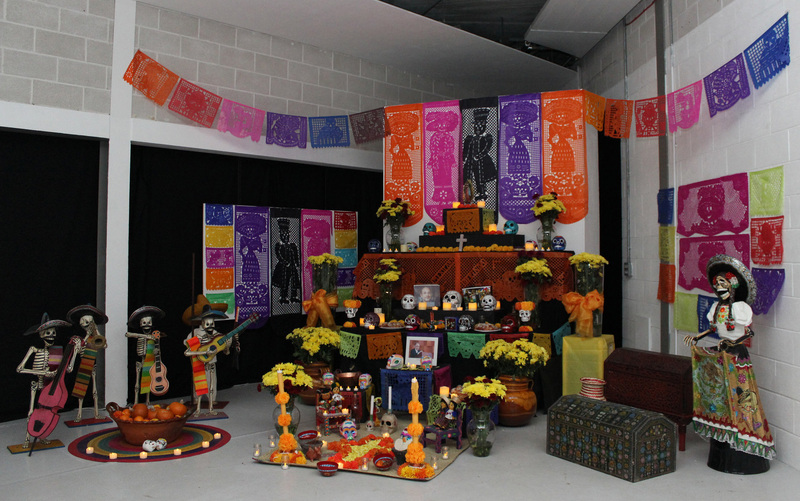 The Mexican Embassy’s Day of the Dead altar in Chelsea’s Triangle Space gallery. An exhibition of work by Chelsea’s Design Research Studio 3, BA Interior and Spatial Design working with course leader Colin Priest, associate leader Takako Hasegawa and artist Mauricio Cervantes took over the Cookhouse. Entitled Sanctuaries, it comprised work by second and third year students exploring material performance alongside samples of work made from cob, a natural building material, which emerged from workshops with the visiting artist. Also featured in the display was a documentary film by participating student Kay Chan. Out in the Parade Ground, a performance created byChelsea’s first year BA Interior and Spatial Design students and staff in collaboration with local charity Millbank Creative Works illuminated and choreographed the space for a public audience. Designed and curated by artist Francis Thorburn, the float and performance was inspired by the traditional Day of the Dead procession. 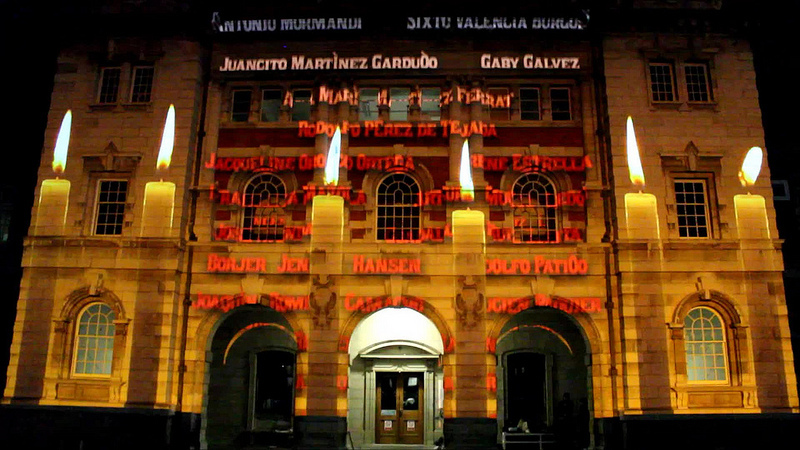 This was followed by a dramatic light display by artist Tupac Martir which brought the facade of one of the college buildings to life. The animation was inspired by traditional Day of the Dead festival imagery with sections focussing on different iconic elements including papel picardo (cut paper) flags, Catrina skeletons and monarch butterflies. Watch the video below for a taste of the spectacle. Mexican food was available for purchase from various vendors on the Parade Ground and London College of Fashion students painted guests’ faces with specially-devised Day of the Dead designs in the canteen at Chelsea. Also on show was work by Camberwell, Chelsea and Wimbledon Foundation students who collaborated with artist Damien Flores and a modern interpretation of a traditional altar was installed in the The Henry Moore Courtyard, created by students on the BA Technical Arts and Special Effects course at Wimbledon who had worked with Pedro Mendoza Ortega. Many thanks to Lewis, The Mexican Embassy and the Anglo Mexican Foundation for their generous support to this event. Students from London College of Fashion provided face-painting. Visit the BA Interior & Spatial Design course page. All images are courtesy of the Mexican Embassy.